Shoregirl's Creations: Cuttlebug Challenge #51 - Thank You! Cuttlebug Challenge #51 - Thank You! The last of the birthday challenges over at Cuttlebug Challenge! I seriously considered skipping it altogether, but then thought I should complete what I started. Inspiration was a little slow flowing though, and I'm not 100% satisfied with what I came up with. Guess I should have seen that one coming though --- it has been a whole month since I started on the birthday theme (and I have a VERY short attention span!). I've enjoyed participating and gained lots of new/fun ideas from the DT of C.C. So once again it's "Happy Birthday Cuttlebug Challenge" and "Thanks for a fun month!" 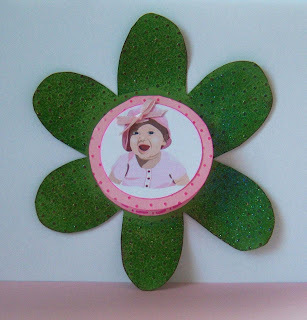 In keeping with the baby theme - I used green and pink cardstock. Embossed with swiss dots embossing folder. Added the sweet baby clip art from the invitation (only smaller this time). Here's the inside of the thank you - you can see the sparkles on the flower better in this pic. Thnakyou so much for joining in with the Cutllebug Challenges this month!!! Adorable!! So glad you partied with us the entire month! Good Luck. 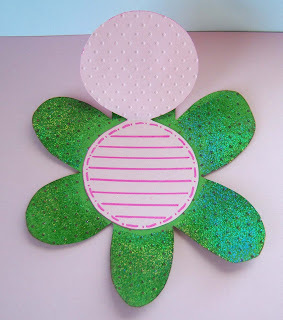 Hope to see you at more Cuttlebug Challenge Blogspot Be Inspired challenges! Cute shape card. Thank you for joining us again at Cuttlebug Challenges. Good luck! Well i think for someone with crafting "ADHD" your card came out great, I love the flower shape!! I wish you good luck with the giveaway!! Thanks so much for partying with us at cuttlebug challenge blog! Esther I have loved your theme this month that image is the sweetest and I know your daughter is going to love this party. Thank you for sharing your talent with us at Cuttlebug Challenge this month. This is the cutest Thank You note! Anyone who received a note like this would be absolutely tickled - this has been a wonderful theme, and I love the pink and green color combo. Thanks for partying with us all month! We look forward to new things with you now on Cuttlebug Challenge!